The MediaPad comes with the Aldiko eBook reader pre-installed and one free book on its virtual shelf - White Fang. You can easily purchase more books from the Store (there are free ones too). The eBook reader allows you to highlight text and lets you search the book for occurrences or look up a word in the dictionary. You can switch between day and night mode, adjust the brightness, change the font and margin size. There's a File Manager app pre-installed that is quite capable - it can do mass move/copy/delete and search for files too. One perk that comes for free with the MediaPad is Cloud+. You're supposed to get 160GB of online storage (instead of the usual 16GB that the service offers). At least that's what the app says at launch. You can sync contacts, store and share files, backup your data and even locate your tablet, lock it and erase its data remotely if it gets lost. For some reason, however, when we signed up, we only received 5GB of storage. The Huawei MediaPad comes with a powerful backup app out of the box. It can do backup and restore for files and apps, it can schedule backups and send files to the Cloud+ storage, where data will be safe even if something happens to the tablet and memory card. 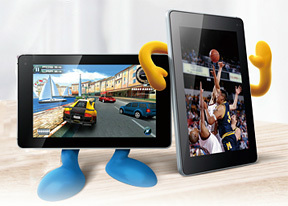 Our MediaPad also came with several games pre-installed - the well-known Angry Birds, Asphalt 6 and Lets Golf 2. The Huawei MediaPad comes with a GPS receiver, which got a satellite lock in under a minute with A-GPS turned off. A-GPS can speed this up quite a bit, but requires Internet access. We gotta say, we didn't experience any issues with the GPS chip performance. The MediaPad comes with Google Maps with Navigation to get you started. Voice-guided navigation has become a viable solution since the v5.0 update. Vector maps are smaller and way easier on your data plan and the Navigation itself is becoming available in more and more countries. With a screen as large (or larger) than most dedicated SatNav units any money spent towards satellite navigation should go to buying a good app rather than a separate SatNav unit. Quite naturally, the app also supports the Street View mode. If it's available in the area you're interested in, you can enjoy a 360-degree view of the surroundings. When the digital compass is turned on it feels like making a virtual tour of the location! With a 1.2GHz dual-core CPU and a high-res screen, the Huawei MediaPad should have no issues running new apps. The Android market is the fastest growing app repository around (also the one with the most free apps and number of downloads), so you can be sure there's no shortage of software to install on your MediaPad. True, some apps aren't designed to work on a WXGA screen, but most scale well, so the only thing you have to worry about is finding enough time to enjoy all those apps. The Android Market makes it easy to find cool new apps through its Featured apps, Editors' picks and Staff-recommended categories, in addition to the usual top free and top paid.